Every day in the United States, people's negligent actions lead to property damage, bodily injury and even death for others. When this happens, the law gives those who were injured—or the family of those who were wrongfully killed—the legal right to file a civil lawsuit and pursue compensation from the at-fault party. However, the fact that an injury occurred isn't enough, on its own, to convince a judge or jury to rule in a plaintiff's favor. 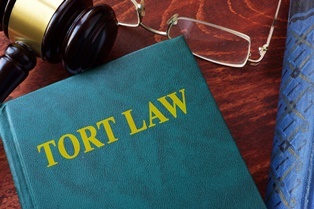 For that to happen, the plaintiff's lawsuit must meet very specific criteria, namely, the four elements of a tort. If you were seriously injured due to someone else's negligence, gaining a basic understanding of tort law and other civil law concepts can help you determine if filing a personal injury lawsuit is right for you. Duty of care: The plaintiff and their attorney must prove that the relationship between the defendant and plaintiff obligated the defendant to protect the plaintiff from foreseeable harm. Breach of duty: Once they've proven duty of care, the plaintiff and their attorney must show that the defendant was negligent in their duty to protect the plaintiff from this harm. Damages: The plaintiff and their attorney must show that real and quantifiable damages occurred. Direct cause: After proving that real and quantifiable damages occurred, the plaintiff and their attorney must demonstrate that defendant's negligence and breached duty of care was the direct cause of the plaintiff's injury or loss. Though personal injury law is much more complex than these four principles alone, cases that fail to meet these requirements are unlikely to succeed. Some attorneys may take all kinds of personal injury cases, while others prefer to focus on specific case types. Finding a personal injury attorney who has experience successfully handling cases like yours is essential. Are You Considering a Personal Injury Lawsuit? If you or a loved one were injured or suffered a loss due to the negligence of others, a settlement or financial award from the at-fault party can help you meet the challenges you're facing as a result of their actions. Before filing your personal injury lawsuit, contact the experienced attorneys at the Morris James Personal Injury Group to discuss your case. The firm offers potential clients a no-cost, no-obligation initial case consultation. Don't wait—contact us today.